No, it’s not Windows Phone 7 we meant with that title. Fujitsu’s LOOX F-07C for NTT DoCoMo is indeed capable of dual-booting Windows 7 and Symbian OS thanks to its clever dual hardware design. The Windows 7 side of things is run by an Intel Atom CPU, 1GB RAM and 32GB SSD. We guess that on the Symbian OS side (unknown version), there’s some simpler phone hardware in charge of things. Do you hear that, Nokia? The two chipsets on the LOOX F-07C share some parts of the hardware – the 4-inch 1024×600 pixels capacitive display, the sliding QWERTY keyboard, the 5 megapixel rear and the VGA front cameras, a common battery, etc. Windows 7 (32-bit) is possible thanks to the 1.2GHz Intel Atom processor (with Hyper-Threading), 1GB DDR400 RAM and 32GB SSD. There’s also GPS, Wi-Fi N and HSPA connectivity. 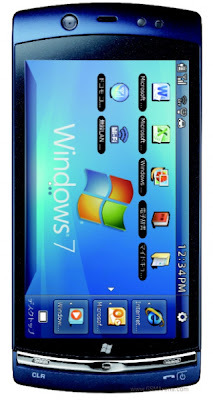 You can seamlessly switch between the Windows 7 and Symbian modes – it just takes a second. It seems that both OS’s keep running until the battery power drops to certain level. When this happens, the phone switches automatically to Symbian, turning off the Windows 7 altogether. Most probably there is some kind of ARM processor inside to keep the Symbian alive. When in Symbian, you don’t have Wi-Fi access, but you get Bluetooth and Infra-Red connectivity instead. The SSD is reserved solely for Windows 7, but you have a microSD card slot (with a 2GB card pre-installed) to enjoy your Symbian apps. The GPS, HSPA and GSM connections seem to be available in both Windows/Symbian modes. The Fujitsu LOOX F-07C weighs 218 grams and measures at 125x61x19.8mm. 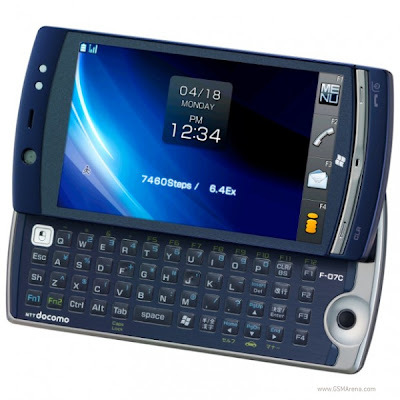 There is no official information on Symbian version or on the ability to make phone calls under Windows 7. According to NTT DoCoMo’s press release, the Fujitsu’s LOOX F-07C should be released this June or July at about $860 in price. Once again, it’s a Japan-only gadget, sorry. This entry was posted in News, Symbian^3 on by Admin.